The heritage of Parfums d'Orsay is multifaceted and prestigious. Count Alfred d'Orsay was born at the turn at the 19th century into a world of elegance and refinement. He grew up learning that intelligence took pride of place, and his natural charisma, charm and provocative style marked him as one of the most famous dandies of the era. He was a true romantic and a creative, turning his hand at painting and sculpting before finding his true passion - perfumery. Parfums d'Orsay was created many years after the Count's death as a testament to his fine art. The collection includes both fragrances created by the Count himself, and modern scents that are made with the same time, passion and dedication of centuries past. The Count created his very first fragrance out of love in 1830. It was a scent for his lover Lady Blessingdon, though both the Lady and the Count were already married to others. The result was Etiquette Bleue, a citrusy, balmy scent with a touch of orange blossom. In order to preserve the heritage of this aristocratic fragrance collection, Compagnie Francaise des Parfums d'Orsay was founded in 1908. 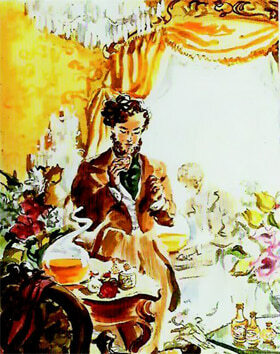 The house utilised the timeless love story of the Count d'Orsay and Lady Blessingdon alongside the Count's elegance and Dandy reputation in order to advertise their fine fragrances. Today, Parfums d'Orsay has been reformulated by artisanal perfumers and each intricate scent has been rejuvenated. From the classic linden blossom scent Tilleul to the newer whiskey-infused Le Dandy, each scent reimagines the life and love of Alfred d'Orsay in a cascade of rare essences.